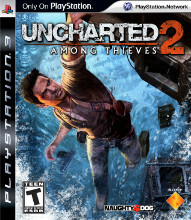 Its been 2 full days since Uncharted 2 came out and I decided to go on the grind to get this review out for you. Playing both nights till I fell asleep with the controller in my hand I went through a lot to get you this review in a timely fashion, and I accomplished that. This isn’t normally the case for our site but when a game is this good, and you just feel that need to keep going, its worth it in the end. Before we proceed, there’s a short test. A. keeping your back foot on the board, while using your front foot to gain momentum. B. shoving that fat kid out of your line. D. obviously new to skateboarding. 2. Which trick is “sick”? D. Coffin down a really steep hill. Ok now, let’s see how you did.